On Thursday, the 28th of June, the 33rd Montreal Jazz Festival had already begun with the first of the hundreds of free, outdoor shows which start at about 2 to 4 PM, each afternoon by the time I made my way inside the Club Soda to attend my first show at 6 PM to hear eclectic guitarist Bill Frisell who has lately chosen to tour his salute to John Lennon titled All We Are Saying! As soon as I enter the dark, multi-level space I notice the makeup of the crowd and it strikes me that this is the same audience that would show up if John Lennon himself were performing. There are 50 and 60-somethings, some with Beatle and John Lennon t-shirts, and only a sprinkling of 20 or 30-somethings who were probably coaxed to come along with Mom & Dad to help them celebrate some of the great music of their lives, the songs of John Lennon as performed by one of the greats of modern jazz guitar. Bill and his fab four of Kenny Wollesen on drums, Tony Scherr on bass and Greg Leisz on steel guitar, choose to start the show on a slower, more mystical note with three songs that show the deep, gentle side of Lennon’s music. The set starts with “Across The Universe,” “Beautiful Boy,” and “You’ve Got To Hide Your Love Away.” The crowd is relaxed and appreciative, responding with glee each time a familiar melody is established. I can’t help but think that Bill is presenting John Lennon as the “Mystical Beatle” equal to George Harrison with these song choices, arrangements and considering how the dreamy twang of the steel guitar blends with Frisell’s playing to create this spacey quality. Then the tempo picks up with songs like “Please, Please Me,” and a rousing version of “Come Together” that is the peak of the show for me. The crowd would not let the band leave for very long until they agreed to an encore at which time Frisell said “There are so many of these songs, it’s crazy.” The crowd calls out for specific tunes that they haven’t heard so far and the band rips into a couple then leave the stage to thunderous applause and a standing ovation. A splendid time was had by all! After “Mr. Frisell Meets The Beatle” I’m off to the Place des Artes and one of the beautiful venues in the complex, The Theatre Jean-Duceppe, to hear the first of four different shows in a row featuring Stanley Clarke who was invited to put together these performances of his own choice in the festival’s “Invitation Series.” Stanley has become quite a regular in Montreal and won the prestigious Miles Davis Award last year while playing with the Return To Forever IV tour at last year’s festival. 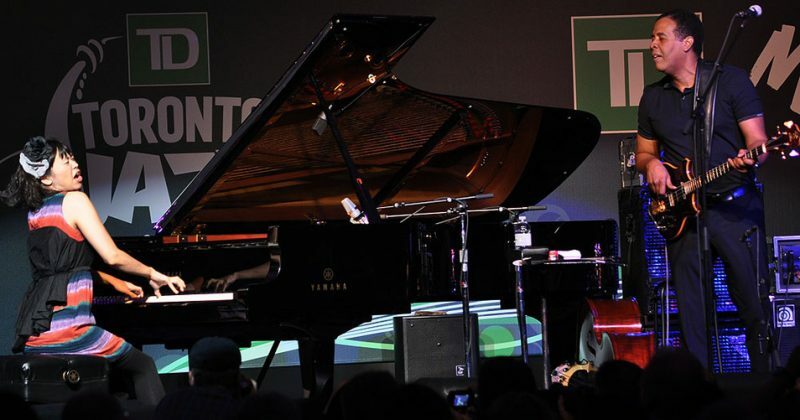 His first show features an acoustic duo of Clarke and his current piano partner in his Stanley Clarke Band, the brilliant, young Japanese-born pianist Hiromi Uehara. I had actually flown in with Hiromi on the same flight from New York and struck up a quick conversation with her once we arrived and boarded a festival shuttle for the city centre. She seemed a bit subdued behind shades and a big, floppy hat and wasn’t ready for too much small talk much less an interview, but when asked what the set-list might be for the show later she simply said “I have no idea.” I should not have been worried as these two have created an incredible musical association in the past few years which, according to Stanley, was almost instantaneous in nature. They had been forced into a “jam” situation the first time they met on a stage and it was magic from the beginning. They have a vast repertoire from which to choose including their own individual compositions, standards, arrangements of folk classics and more. The set was seamless and an absolute delight as their musicianship is astounding and they obviously enjoy playing together immensely. There is lots of playful interaction, incredible dynamics and variety in the music and as Stanley introduced each song with entertaining stories and details the music is enhanced even further. These two are truly an odd couple of jazz as Hiromi is about half Stanley’s size and he’s 6′ 4″ but when his hair was at it’s fullest he was nearing 7′! They are absolutely close in talent without a doubt. Stanley has told me that Hiromi is the most powerful pianist he’s played with and remember he’s been alongside Chick Corea for decades and any number of greats of the keyboard. Her nimble and powerful fingers flew across the piano with power and finesse, matching Stanley note for note. It was indeed a glorious set and they were well into the second hour of their performance, so much for not knowing what to play, when I noticed that I had to leave to make the last show of the night. It’s the nature of the overlapping schedule of a festival when you’re trying to catch as much as possible but if that’s the worst thing to happen to me I think I can handle it. I made my way next door to the Theatre Maisonneuve for Spectrum Road. There seems to be lots of attention being paid these days to the memory of Tony Williams and his organist Larry Young, who along with the master English guitarist John McLaughlin created one of the pioneering Jazz-Rock outfits, The Tony Williams Lifetime. Spectrum Road, the quartet of John Medeski, Vernon Reid, Cindy Blackman Santana and Jack Bruce, was formed to recall and salute the music of the great Tony Williams Lifetime and, after witnessing the performance at the Montreal Festival, remind people of the power of not only this band but of the Jazz-Rock-Fusion movement in general. Vernon Reid on guitar played the part of John McLaughlin with flair and served as primary spokesman for the night from the stage. There is no diminishing the importance of organist Larry Young to this bands legacy and John Medeski on the organ and other keys was indeed the perfect guy for the job in this eclectic quartet. Jack Bruce, as you may know, was actually a member of Tony Williams Lifetime for awhile when McLaughlin was in the band and I’m sure having a member of Cream in your “Jazz Band” helped Tony Williams achieve the goal of creating a powerful unit that could have held its own in a stadium show as easily as a small club. And then there’s Ms. Blackman-Santana behind the kit. Cindy, along with Terri Lyne Carrington and a few others, are doing more to dispel the rumor that playing drums and driving the band is “a man’s job” than any other artists in jazz history. On this night she helped conjure the spirit of Tony Williams as much as anyone in the quartet and played an essential part, literally never missing a powerful beat! This show was gentle and subtle in nature…as gentle as an 18-wheeler barreling through a Montreal Walmart’s front door at 100 miles per hour and as subtle as an elephant running through your backyard garden party on the 4th of July! This was all about power, and the band had a machine-like quality honed over what is now almost 4 years of existence and extensive recording and touring. As Vernon Reid explained, the impetus for this band came from the spirit of Tony Williams who, from the beginning of his career when he was only a teenager, was all about being himself no matter the cost. If one can live his or her life on their own terms then so be it and that seemed to be the mantra that drove the life and music of Mr. Williams, and those who joined in and followed him, including the members of Spectrum Road. The set list was taken from Tony Williams Lifetime albums as well as from other fusion heroes, like Jan Hammer. This show was to remind those who attended that Jazz-Rock-Fusion was a powerful genre, filled with unbridled energy and sometimes distortion and dissonance. For some in the audience that was too much and the crowd thinned as the hour grew late. Maybe they had to work early the next day, or maybe they just were not hard-core fusion fans. I suspect the latter in most cases as this was indeed a “hard-core Fusion” show in all its volume-heavy glory. It was just like being there in the beginning for the Jazz-Rock-Fusion revolution. I for one enjoyed the reminder. To find out more about what’s happening at the 33rd Festival International de Jazz de Montreal just visit the festival website. From Montreal, Russ Davis here…over and out for now.